Ryan Taylor puts up a floater. 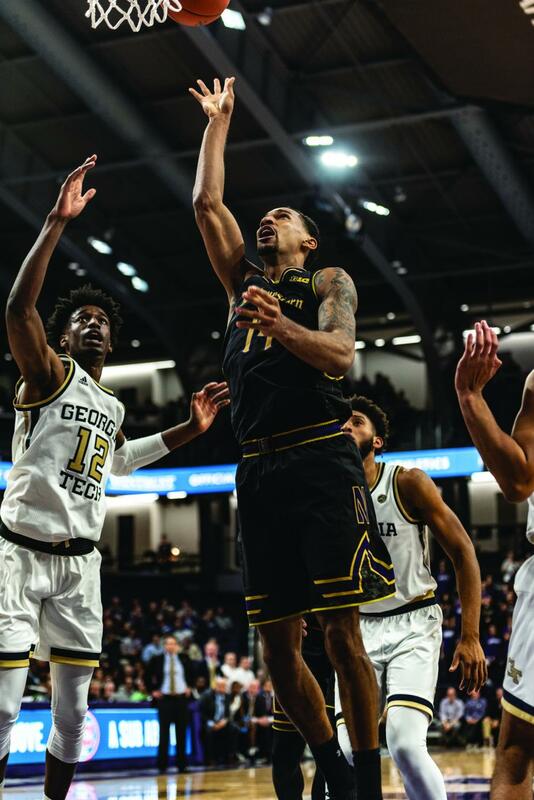 The graduate guard had 20 points in the win over Georgia Tech. For 24 minutes Wednesday night, Northwestern played its best basketball of the season. For the next 16 minutes, the Wildcats played some of their worst. But the good outweighed the bad. Graduate guard Ryan Taylor scored 20 points, senior forward Vic Law added 14 and NU (6-1) withstood a furious Georgia Tech rally to defeat the Yellow Jackets, 67-61, in the ACC-Big Ten Challenge. The Cats played suffocating defense in the first half, holding Georgia Tech (4-2) to just 20 points and 25 percent shooting. Guard Brandon Alston, the Yellow Jackets’ leading scorer entering the game, was held scoreless in the first half and finished with just six points. NU found a rhythm offensively as well with Law leading the way. He scored 10 points during a 22-6 extended run that lasted nine minutes, after which the Cats led 30-11. Sophomore guard Anthony Gaines hit a buzzer-beating 3-pointer at the very end of the first half to give NU a 40-20 lead and send the largest crowd yet at the new Welsh-Ryan Arena into a frenzy. The start of the second half was more of the same, with the Cats opening on a 10-2 run to stretch their lead to 50-22. Taylor hit back-to-back 3-pointers to cap that run and force Georgia Tech to call a timeout. The game appeared to be over at that point. But the Yellow Jackets had other ideas, and some sloppiness by NU let Georgia Tech back into it. Guard Jose Alvarado was the main catalyst for the Yellow Jackets’ comeback attempt. After scoring just five points in the first half, Alvarado scored 19 in the second — on 6-for-10 shooting — to finish with a game-high 24. Slowly but surely, the Cats’ lead got smaller and smaller. Still, NU made enough baskets down the stretch to keep the Yellow Jackets from getting too close. Senior center Dererk Pardon, who recorded his third double-double of the year with 12 points and 10 rebounds, had a pair of key dunks. Law hit a clutch jumper with less than a minute remaining to put the Cats up by nine and essentially ice the game. After struggling in the nonconference portion of the slate last year, NU is doing a much better job this year, which bodes well for its NCAA Tournament hopes down the line. Winning this game was an important step, as was last Sunday’s victory over Utah.